Lan Gui Ren, which translates to "Lady Orchid", originates from the southwestern province of Yunnan, China. This tea is produced by tightly compressing the grinded tea leaves with powdered American Ginseng and Liquorice Grass into the shape of tiny tablets. The infusion yields an amber colored beverage with a mesmerizing sweet ginseng aroma. The rich taste and its sweet aftertaste makes this a very desirable scented tea.the tea leaves with powdered American Ginseng and Liquorice Grass into the shape of tiny tablets. The infusion yields an amber colored beverage with a mesmerizing orchid aroma. The rich taste and its sweet aftertaste makes this a very desirable scented tea. The taste is somewhat thick and strong, with a very sweet aftertaste and liquorice tingle. 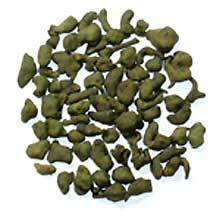 Grinded tea leaves, coated with a thin layer of powdered American Ginseng and Liquorice Grass.